The author of the Canterwood Crest series switches from horses to magical unicorns in this chapter-book series opener. Princess Bella lives in the Crystal Kingdom, where magic, unicorns and royalty coexist with intercoms and photography. 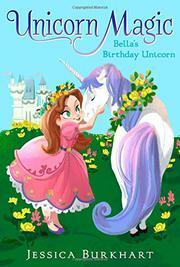 As a royal, Bella’s eighth birthday is important—her aura will become visible, and she will get her own unicorn. Three birthday storylines ebb and flow: Bella’s commoner best friends feel left out by the royal traditions; Bella periodically worries that no unicorn will Pair with her at the unicorn ceremony; and a mysterious woman with an evil, red aura and her own bad unicorns is rumored to live on the edge of town. While the book respects Bella’s friends’ feelings with regard to privilege, the plotline is simply resolved—at first only royals are allowed in the special birthday parade, and then that’s changed so her commoner friends can attend. Rather like the evil fairy in “Sleeping Beauty,” the mysterious woman arrives, uninvited, to trigger exposition and then leaves. The unicorn ceremony also passes without tension or surprise. The plotting is borderline adequate and doesn’t sparkle nearly as brightly as the descriptions of delicious meals, jewelry, unicorns and, most fulsome, dresses. Easy-to-read, descriptive prose is augmented by friendly illustrations.